Compte rendu publié dans Acta fabula : "Relire la Renaissance à l'aune de l'érotique homosexuelle" par Audrey Gilles-Chikhaoui. Focusingon multiple aspects of Renaissance culture, and in particular itspreoccupation with the reading and rewriting of classical sources, thisbook examines representations of homosexuality in sixteenth-centuryFrance. 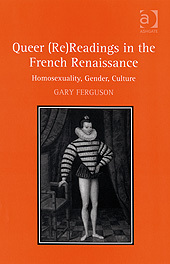 Analysing a wide range of texts and topics, it presents anassessment of queer theory that is grounded in historical examples,including French translations of Boccaccio's Decameron, the poetry ofRonsard, works in praise of and satirising Henri III and his mignons,Montaigne's Essais, Brantôme's Dames galantes, the figures of theandrogyne and the hermaphrodite, and religious discourses and practicesof penance and confession. Close comparison with the ancient models onwhich they drew - the elegy and epic, the works of Plato, Ovid, Lucian,and others - reveals Renaissance writers redeploying an established setof cultural understandings and assumptions at once congruent and atodds with their own society's socio-sexual norms. Throughout thisstudy, emphasis is placed on the coexistence of different models ofhomosexuality during the Renaissance - homosexual desire wassimultaneously universal and individual, neither of these viewsexcluding the other. Insisting equally on points of convergence anddifference between Renaissance and modern understandings ofhomosexuality, this book works towards a historicisation of the conceptof queerness. Introduction:pre-modern (homo)sexuality: historical and theoretical issues;Homosexuality and gender: historical (trans)formations; Homosexuality,nature and taste; Queer (re)readings; Italian imports: tales of Sodomand other cities; Splitting hairs: (re)reading (with) Ronsard;Mourning/scorning the mignons: representations of heroism andfavouritism at the court of Henri III; Montaigne's itchy ears:friendship, marriage, (homo)sexuality, and scepticism; Androgynes,hermaphrodites, and courtesans: women, queer nature and (queer? )pleasures; Towards modernity: on kissing, whipping, confession, and thecloset – François de Sales and Henri III; Bibliography; Index.